Let’s face it, there are some cleaning tasks that can be done once a month, but how do you know when a month has passed or even the last time you cleaned that specific item in your home? 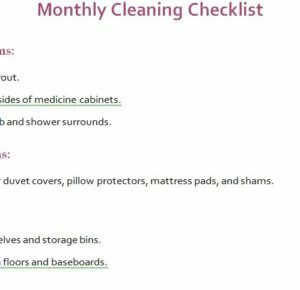 The free Monthly Cleaning Checklist was designed to help you figure it all out by creating a checklist you can run through just once a month to tackle those chores once and for all. The simple Word document has everything you need to get started with your monthly cleaning list. All you need to do is edit the template to suit your needs. To download and learn how to use the template, just read the guide given below. You will first need to download the free template sheet to your computer by following the link we have provided for you below. Now, change the category items to the rooms of your actual home so they match up with the structure of your house. These category items will be highlighted in purple. The next step is to go through the tasks that are listed below each category and change those as well. You can look at the examples to get ideas about what can be listed on the template, but the document should be unique to your own home. As an example, under the “Bathrooms” category you could list “Scrub the Grout” because this is something that you can’t do every day but would be acceptable to perform once a month. When you’re finished with your template, just scroll back to the top of the page and select the “File” button in the Home Ribbon. From there, choose the “Print” option to have your very own sheet. This template makes cleaning monthly tasks, quick, simple, and organized.